Spray cookie sheet with nonstick spray (or olive oil). Sprinkle with corn meal (optional). Spread pizza dough on cookie sheet and bake for 5 minutes. 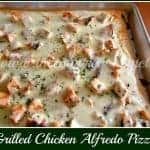 Take out of the oven and spread alfredo sauce over crust. On top of sauce, add diced chicken, onion and spinach (if using). Bake for additional 8-12 minutes until cheese is melted and crust is golden brown. Fresh spinach can be used with this (use about a handful, and cut it into ribbons). Also, this meal was created using mostly convenience products to make this a quick and easy meal (and to use less dishes). If you have time, you can really get creative with this meal by making your own pizza dough and alfredo sauce.